The ultimate in protection for the most discerning sea captain! Marine 31 Gel Coat Carnauba Wax + Sealant imparts a highly protective, high-gloss finish on your boat's gel coat and metal surfaces. 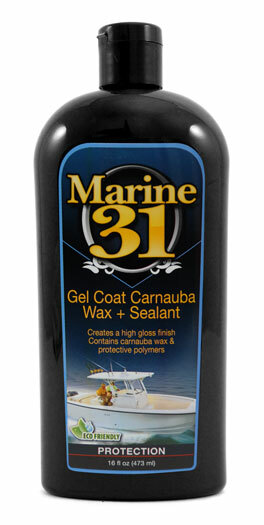 Marine 31 Gel Coat Carnauba Wax + Sealant was formulated in the nautical environment of south Florida. It is a blend of purified carnauba wax and crystalline polymers designed to create a blistering shine that radiates across the water and lets other sea travelers know that you take pride in your ship. Marine 31 Gel Coat Carnauba Wax + Sealant is easy to apply and effortless to remove. The combination of the sun and water creates an environment that is constantly trying to rob your boat of it's shine. Marine 31 Gel Coat Carnauba Wax + Sealant combines the best protective ingredients of carnauba wax and premium crystalline polymers to block out these harmful elements and keep your boat looking its best. Protect your shine by applying Marine 31 Gel Coat Carnauba Wax + Sealant on a regular basis. Marine 31 Gel Coat Carnauba Wax + Sealant is formulated with high-quality carnauba wax to coat your boat in a high-gloss shine that is amazingly water repellent. Selected crystalline polymers and powerful UV absorbers block out the sun's damaging ultraviolet radiation by providing durable protection that lasts. The combination is unbeatable. Regular application of Marine 31 Gel Coat Carnauba Wax + Sealant will keep your boat protected and looking its best. Salt, barnacles, and mildew will have a hard time adhering to the protected finish. The intense water shedding ability of Marine 31 Gel Coat Carnauba Wax + Sealant will help your hull glide through the sea's waters with ease. A Word From The Captain�s Chair: Gel Coat Carnauba Wax + Sealant is the cornerstone of Marine 31's systematic approach to watercraft care. Use Marine 31 Gel Coat Spray Wax Plus to maintain and replenish the shine. Regular washing with any of Marine 31's carnauba-based washes will intensify the shine and keep your watercraft looking its best!